Brooklyn is New York’s most populated borough, with over 2.6 million inhabitants. The name Brooklyn derives from the city of Breukelen in the Netherlands. 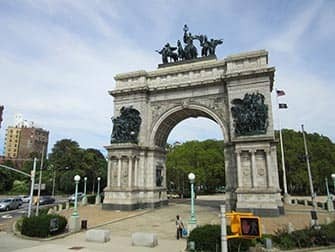 In addition to the Dutch, Brooklyn’s history has connections with many cultures and nationalities such as Russian, Ukrainian, Italian, Puerto Rican, Hasidic Jew and Jamaican to name but a few. It seems like Brooklyn is calmer and more relaxed than bustling Manhattan yet, it is far from boring. You can do and see a lot: spend a fun day at Brooklyn Bridge Park, visit Coney Island in the summer and at Christmas see the amazing decorations in Dyker Heights. 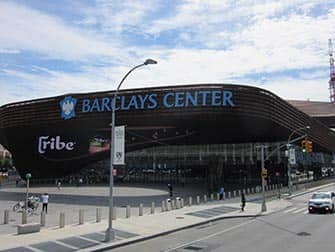 Cheer on the Brooklyn Nets at Barclays Center, shop at the hip stores in Williamsburg and, most relevant, walk back to Manhattan over the Brooklyn Bridge while enjoying the amazing view. If you don’t feel like exploring Brooklyn on your own consider joining one of the many guided tours available. Feeling adventurous? Consider renting a bike to explore Brooklyn. 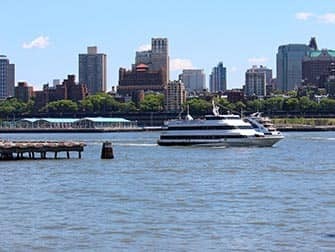 You can take a walking tour through Brooklyn if you would like to see a lot, you’ll go to famous landmarks and neighbourhoods like Brooklyn Heights and DUMBO. If you’d like to include food in your tour, I recommend the Brooklyn Pizza Tour. You’ll learn more about Brooklyn and Coney Island whilst sampling some delicious New York pizza. For an uplifting experience, take the Brooklyn Gospel Tour. Walk by some beautiful brownstones in Brooklyn Heights and enjoy the beautiful view of Manhattan. This tour ends with a live gospel performance by the Grammy-Award winning choir at the famous Brooklyn Tabernacle. 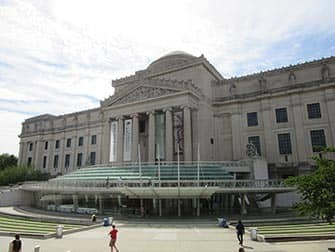 The Brooklyn Museum is the second largest museum in New York housing almost 1.5 million works. The museum’s collection includes American, European and Egyptian art works along with artefacts from Africa, The Middle East and The Pacific Islands. Furthermore, in 2007 the museum opened the Elizabeth A. Sackler Center for Feminist Art. Some of the artists that can be found in the museum are Cézanne, Monet, Degas, Manet, Renoir, Kandinsky and Rembrandt. If you want to go for a bite before or after your visit to the museum, try Barboncino at 781 Franklin Avenue. Their brick-oven pizza’s are delicious and during the weekends they serve a tasty brunch. Opening Hours: Wednesday to Sunday 11:00 to 18:00. Thursday until 22:00. 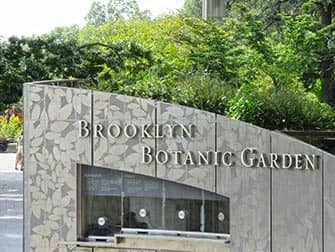 Brooklyn Botanic Garden is a magical place where you can escape the concrete jungle for a while. Founded in 1910, it is made up of many smaller gardens. The Cherry Esplanade is very famous: it has more than 200 cherry trees and their blossoming is a big and celebrated event. The Japanese Hill and Pond Garden was the first Japanese garden created in an American park. It has a koi pond, Japanese temple, a Shinto shrine and Bonsai. At the Cranford Rose Garden you can see nearly 1,400 species of rose. The Children’s Garden is a community space where kids can learn and grow their own plants. The Fragrance Garden is a garden designed for the vision-impaired where everyone is invited to experience the plants in a different way: touching, rubbing or smelling them. At the Yellow Magnolia Café you can relax and enjoy some organic food. 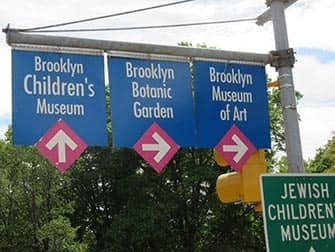 If you are travelling with kids, it might be a fun activity to go to Brooklyn Children’s Museum. It’s like a big indoor play area full of activities designed for the little ones. There is sensory play for toddlers with water, sand and sounds, pretend markets, pizzerias and giant lego. There are exhibitions on animals and, sometimes it is even possible to pet a snake. It gets quite busy, so be prepared. Kids can go wild and parents can relax knowing it’s a safe environment. If you want to learn more about NYC’s subway and its history New York Transit Museum is the place to be. It is set in a real subway station where you can view old subway cars and see how they evolved over the years. The exhibitions are visual and interactive, making it interesting for everyone. At the gift shop you can get cool souvenirs to take back home. Shake Shack is just one block away, so after your visit to the museum you can try one of New York’s best burgers. Sunset Park is where you will get the authentic Hispanic vibe in Brooklyn. It’s a nice area to walk around during the day and experience something totally different to Manhattan. Take the subway D, N or R to 36th Street and walk through 5th Avenue. This is also a good place to have lunch as there are many nice little restaurants. Try some Peruvian food at Super Pollo or for some delicious chorizo tacos head to Tacos Matamoros. Visit Sunset Park (the park with the same name as the neighbourhood), sit on the grass and enjoy the beautiful view of Manhattan (you can even see the Statue of Liberty). If you’re staying a little later, this is a perfect spot to watch the sun set. If you’re interested, the beautiful and peaceful Green-Wood Cemetery is also nearby.